Direction: US-15 S/US-29 S toward Culpeper. Left onto James Madison/US-15 Bus S. Left onto E Main St. Cross RR tracks to left onto Tin Pot Run Lane. Turn Rt. onto Lucky Hill Road. Property is on left and has a long driveway. Lot on right of driveway. 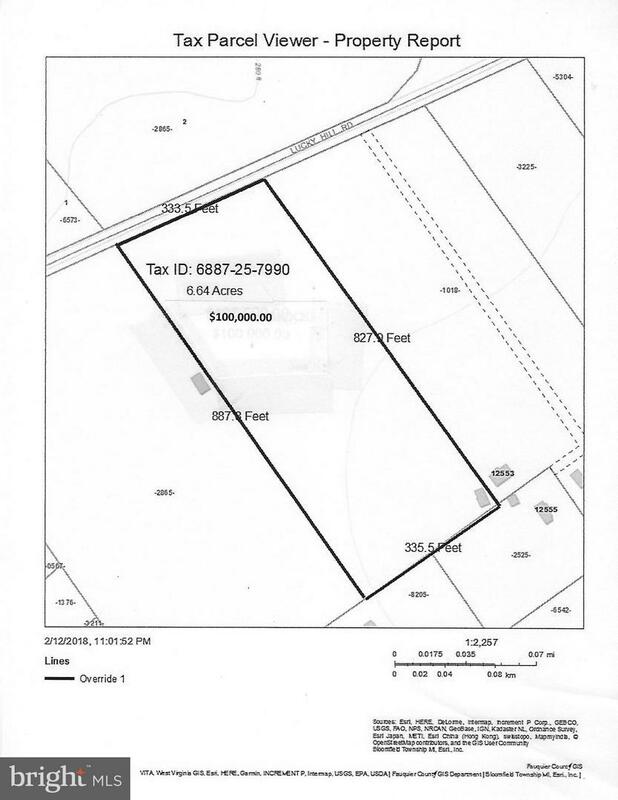 LUCKY HILL ROAD , Remington VA 22734 is a Land, with 0 bedrooms which is for sale, it has 289,238 sqft, 289,238 sized lot, and 0 parking. A comparable Land, has 0 bedrooms and 0 baths, it was built in and is located at LUCKY HILL ROAD REMINGTON VA 22734 and for sale by its owner at $ 100,000. This home is located in the city of REMINGTON , in zip code 22734, this FAUQUIER County Land, it is in the NONE AVAILABLE Subdivision, and REMINGTON are nearby neighborhoods.